As a blogger, you probably could have guessed that I like to write. I've kept journals on & off since I was ten--it's just part of who I am. I know not everyone loves putting pen to paper like I do, but during pregnancy, a time of such change in your body, your emotions & your life as a whole, journaling is so important. 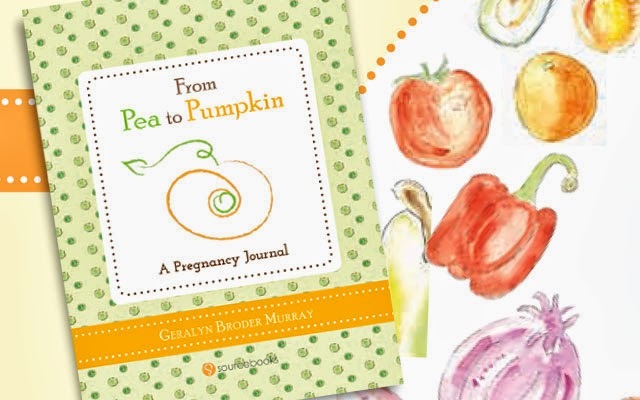 Pea to Pumpkin, by Geralyn Broder Murray, is an illustrated pregnancy journal that's a great option for mamas-to-be who are a little short on time or writing inspiration. The journal makes it easy to write a page each week along the way, with sweet little prompts about things you are probably thinking about anyway & space for photos or ultrasound images. It's not a tell-all, scare-you-with-things-to-worry-about journal like some that I've seen. Pea to Pumpkin's illustrations will just leave you thinking about the various rotund fruits & veggies that are approximately the same size as your baby each week, plus what you want for the child once they're born. It isn't a place to keep track of your midwife appointments or test results or weight, because years from now, is that really what you'll want to have on paper? By the end of your pregnancy, you'll have a lovely collection of memories to show your child in the future & look back on yourself. You can pick up Pea to Pumpkin at lots of bookstores, Babies R Us or online here. Visit the Pea to Pumpkin Website for more information & a whole section of inspirational art, like their Facebook page for updates, or check out the visuals on Pinterest. Disclaimer: I received a free review copy of Pea to Pumpkin but was not otherwise compensated for this post. I had a pregnancy journal when I was pregnant with Jonah, and am very glad I filled it in every day. I couldn't find one I liked when I was pregnant with N&K, so I used my old one over again, with a different colour ink, as there were enough blank spaces left to write in. Now I doubly treasure it, as all my memories are in one book, and it was a neat way to compare both pregnancies, week by week.